Summer Stroll.This Acrylic is now re-framed in a broad white picture frame. £270. Summer Flowers. Acrylic on board, unframed. Inspired by a Scottish meadow. Acrylic on art board, 18"x 14" approx. 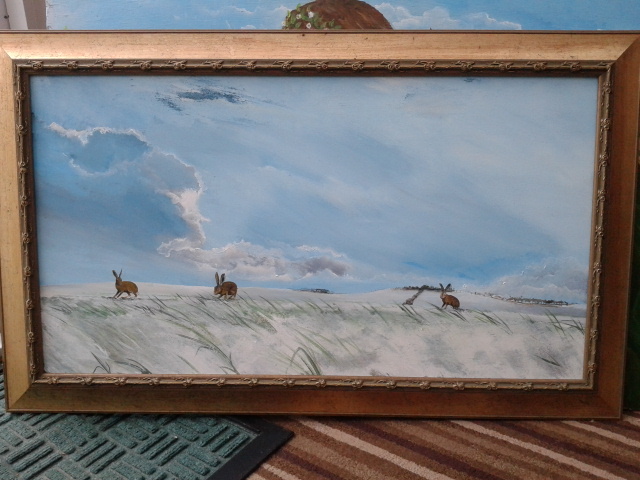 ​Inspired by a friend who used to watch hares on the beach on the island of Rhum. A 30" square piece, inspired by talking to a friend who kept a pet hare as a girl. the hare is skimming the ground, when flat out they almost are flying! £300 framed. A calm picture of a Scottish hare, on a misty Trossachs hillside. Acrylic and pen, a recent re-visiting of an older concept from 25 years ago. One of several images drawn and painted for Adele McMillan's new book. A great product and a proportion of profits go to charity. The book , with five illustrated short stories is available from Baxter's Gifts online. Gaia's perfect breast, the turning of the year. One of a short series, £200 unframed. This is for sale in the Ian Mcnab gallery , in Dunblane. Acrylic on board. 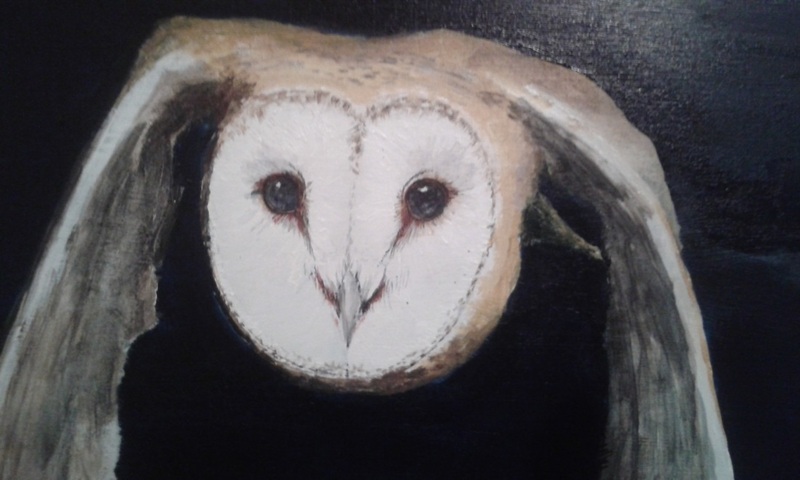 This is painted on antique chinese pot stand, another Barn Owl. A detail from a recent piece, actually it was not quite complete when this photo was taken. Think £160 framed for this one. 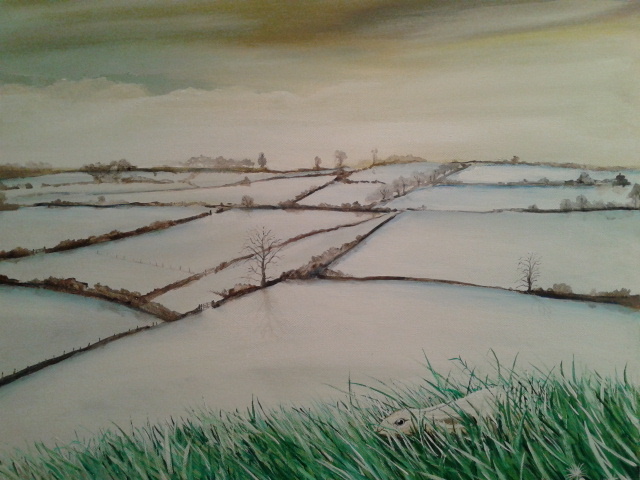 Acrylic picture of three hares in the late winter snow, spring just around the corner. An acrylic on board of a cat dreamily gazing at a butterfly. Don't worry the butterfly escapes! 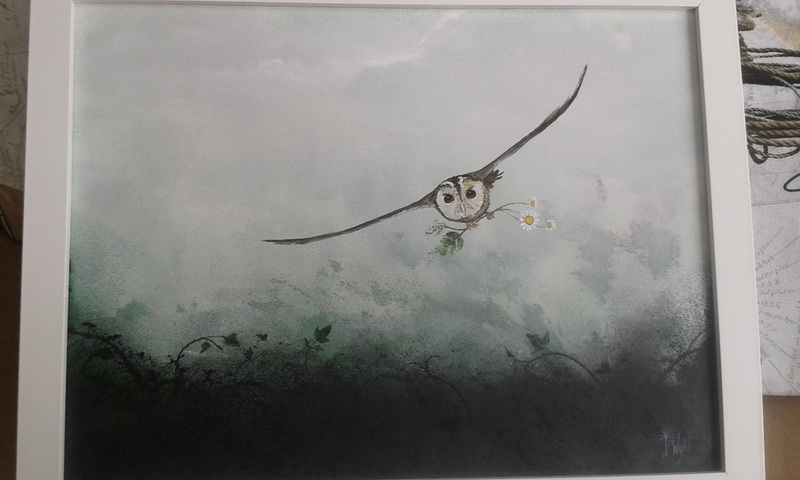 £190 or framed for £240, please call to discuss postage at cost. Interested in buying a picture from this site? Puss, Timey and Bess again, in an old frame to protect it at the moment. As stated above, £160 and could be framed at an additional cost. Acrylic on board of a beach scene. 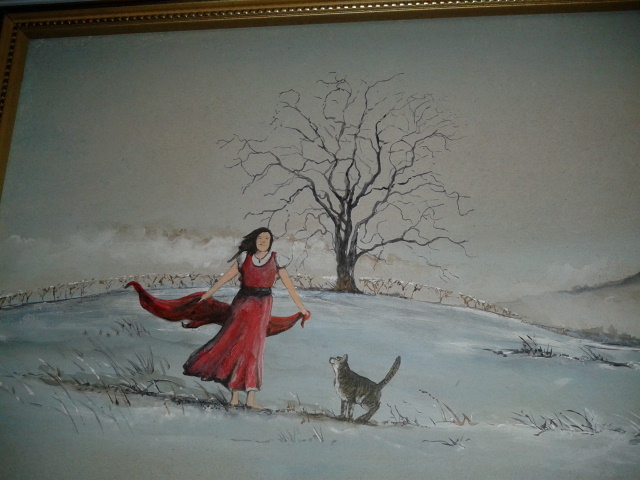 My theme is a common one of mine, a figure isolated in an open landscape, this time with a cat. In case you think "A cat on a beach?" behind you at this beach is a farm on a wee Gower mountain, from where the cat would saunter down the strand. Acrylic on canvas, available via Ian McNab's Gallery in Dunblane. Two girls, heading out through the bitter cold, to a distant farm. They are on the edges of the drained marshes that make up the farming hinterland of the Stirling area. A smaller piece , £65 framed, last remaining one of a small series of hares. A couple of images of a series I did based on old country photos I came across in dusty books. 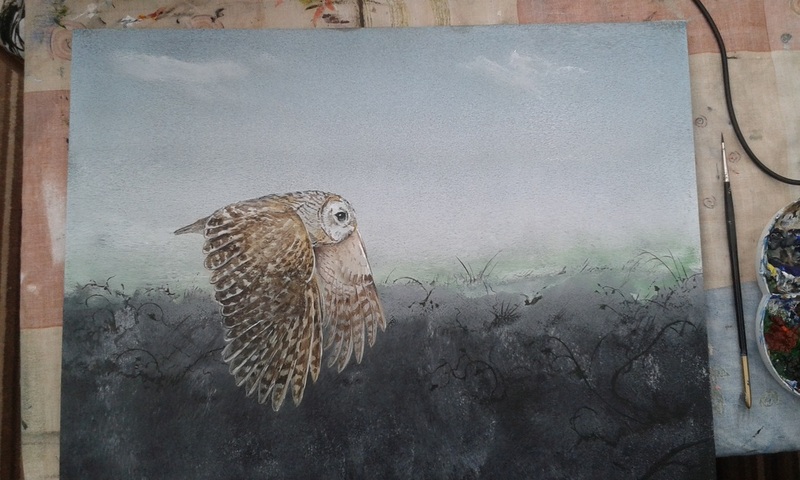 The right hand painting is still available, framed for £55, it is about 7 x 5"